It was weird. There seemed to be no reason for me to be here. It’d been three days since I’d flashed in at a remote spot on the edge of town. Since then I’d been hanging out and gathering information. It was Los Angeles, 1880—a boomtown suspended somewhere between frontier realities and wanting to be cosmopolitan. The Southern Pacific had arrived four years earlier, bringing in streams of new settlers, along with plenty of moral ne’er do wells determined to steal an easy living from honest folks. The lawless element remained alive and well. I was relaxing at a corner table at a saloon not far from the railroad station. The big, open room had a couple dozen straggling customers scattered around it. Several world-weary ladies were milling around hoping to stir up some backroom business. A plate loaded with beef and beans steamed in front of me. My eyes were resting on the young woman who’d served me. She carried herself with a mixture of pride and modesty that inched close to defiance. The best looking female in the joint, it was clear that she was a waitress, not a working girl—it was equally clear she took no guff off anyone. She moved about her tasks with a mind set on doing a job well. She was long and leggy, a coppery-skinned beauty with large dark eyes and a thick tumble of shimmering black hair bouncing on her shoulders. Her skirt was full and flowery, topped off by a billowy blouse which was buttoned to the top of the collar. The loose-fitting clothes couldn’t hide the enticing curve of her hips or the sweet swell of her bosom. I wasn’t the only one enjoying the flow and grace of her movements. Every red-blooded male kept at least one eye fixed on her. A jerk at the bar on his way to being drunk had obviously zeroed in on her. Trouble was brewing. I could smell and taste it in the air. A brain-dead drop-out from Moron University could see that the brute leaning against the bar was a first-class bully. He was talking loud, cracking wise, and making lewd remarks. He carried a gun low on his left hip, tied down as though he knew how to use it. He had a thick barrel-chest and wide shoulders, a giant of a man with sleeves rolled up to reveal powerful looking forearms. What little neck he had was corded. Round-faced and grinning, he was making no attempt to disguise his leering or intent. “Juanita,” he barked when she slipped in behind the bar. “Get me another bottle,” he demanded, slapping a coin on the bar. Juanita considered him for a moment, narrowing her eyes in disgust. She let out a sigh and slid a bottle of bourbon to him. He reached for her, attempting to grab a wrist, but she swished away with the ease of a butterfly. He wheeled around. A collective gasp came from the crowd, as though everyone sucked a flood of air into their lungs all at once. I stepped toward him, not pausing or slowing a bit. He eyeballed me from top to bottom—his disdain was palpable, his face flushed crimson from a combination of alcohol, lust, and anger. As I closed in on him, I realized that from a distance I hadn’t measured him well—he was much taller and wider than I’d surmised. He was a raging bull encased inside human skin. There was not an ounce of fat on him. If wisdom had reared up in me, I’d of rapidly devised an exit strategy, but the path before me was set. I went directly up to him. He stayed solid in his tracks, legs spread wide and hands on his hips. From his size and girth, I knew I had to strike first, which I aimed to do. I figure bullies deserve whatever they get—my simple rule is that when delivering a message to a bully it needs to be accompanied by a load of hurt. I determinedly strode in to confront him. He allowed me to get close—real close. His confidence emboldened him, and perhaps with good reason. In a fair and square brawl, I was grossly outmatched, which was why I had no inclination to be honorable. I struck without warning. While keeping my gaze locked on his eyes, I unleashed my right leg and kneed him in the groin with all the force I could muster. The blow struck everything he had packed between his legs, but he didn’t even flinch. My eyes bugged open. He should’ve buckled over and collapsed in a heap—he should’ve curled into the fetal position. Instead he bellowed laughter, feinted with a right, then landed a left flat on my chin that sent me sprawling to the floor. Now I’ve been in a fight or two, and I know how to handle myself, but I’d never been hit by such a sledgehammer fist. I came up just in time to catch another punch that slammed out of nowhere, tossing me onto my backside once more. “I ain’t got time for this,” Harley growled, going for his gun. It cleared leather and a gunshot roared. I winced, reflexively coiling up to receive the bullet, but nothing happened. There was no hot surge of pain anywhere in my body. My eyes had squeezed shut—I opened them to see Harley clinging to his gun hand, which was dripping blood. “Make a move, Harley. The next bullet goes in your heart.” I glanced in the direction of the voice. Filling the doorway was a tall man with a smoking pistol in his hand. 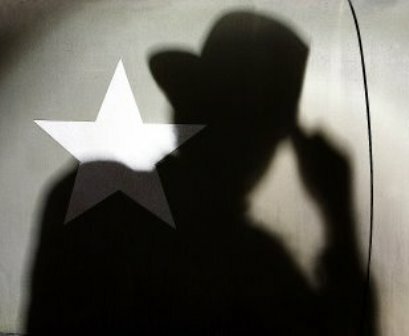 The gunman wore his hat low on his forehead, but even with his face in the shadows, there was something familiar about him. A shiny silver badge decorated the left lapel of his cowhide vest. “There was no cause to shoot me, Wilson,” Harley blustered, grimacing. Harley glared at him. There was hate in his eyes—the kind of hate that gnaws away at one’s soul, making it a bitter and poisonous mess. His mouth was working to say something, but common sense prevailed and he clammed up. He slipped past Wilson and out the door. Juanita moved close to Wilson. A fluttering look passed between them that told me all I needed to know. There was tenderness and respect in their love for each other. She whispered something to him, then tossed me a grateful smile. “I’m Tad. Tad Wilson,” he exclaimed, reaching down to help me up. Our hands gripped together; in that instant, gentle calmness settled in my spirit like a dove. Standing and staring at him, I could see the little boy inside the man—the little boy I’d met in New Mexico, along with his older sister, but that was many miles and years ago. “You growed up just fine, Tad,” was all I could manage. We sat together at the corner table as I finished my meal. The big news was that Juanita and Tad were scheduled to be married in two days. A fancy shindig was planned. His sister would be arriving with her husband and children from Oregon. Now there was purpose in me being here. The afternoon disappeared into nighttime as we visited and shared our lives together. It was good to be in the city of angels.